Clarified butter has a smoother flavour, can be heated at higher temperatures, splashes less, does not leave brown specks and can be stored for longer than regular butter. 2. Skim the froth (proteins). 3. Pour out gently, separating the milk from the fat. 1. Boil the asparagus in vegetable stock. 2. Drain the asparagus in a strainer and keep warm. 1. Crush the hard-boiled eggs with a fork. 2. Add the eggs and the parsley to the clarified butter. 3. Season with pepper, salt and nutmeg and some drops of lemon juice. 1. 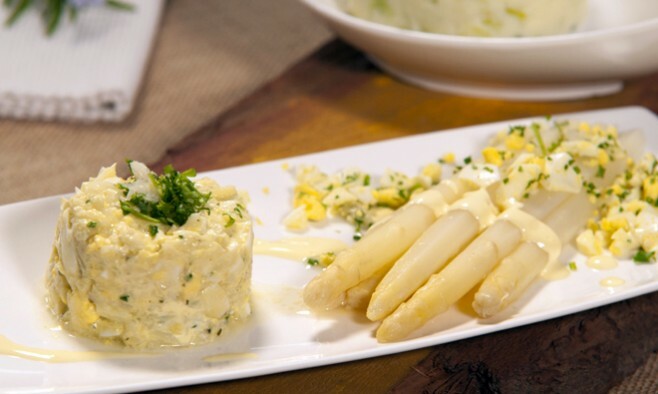 Serve the asparagus warm, basted with the egg mimosa and clarified butter. Reserve the cooking liquid from the asparagus, add, if required, the rinsed peels of the asparagus and reduce. You will need this to purée.The egg mixture can be mixed with or without the clarified butter. Be aware, this can result in a mayonnaise-like mass. Level 6: cut, or crush the asparagus to required consistency. Level 5: boil the peeled asparagus for a bit longer and grind them. Level 4: boil the peeled asparagus for a bit longer and purée them with 1 tbsp of reserved cooking liquid, rub the eggs through a fine sieve, cut the parsley very finely.